collected by worker bees combined with plant nectar and bee saliva. 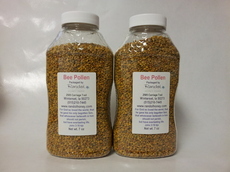 Bee Pollen is gathered from pollen laden bees by a special device placed at the entrance of the hive. The device is designed to brush the material from the bees' legs. Bee Pollen has been called nature's perfect food because it is rich in vitamins and contains almost all known minerals, trace elements, enzymes, and amino acids. This is possible because bee pollen captures the essence of every plant from which it collects pollen. In addition, Bee Pollen contains digestive enzymes from the bees. Pollen, as we already know, as well as being a natural remedy, is also a very good food. mixed with wheat germs; added to a piece of bread with butter and honey; etc., etc.